Hawaii Native Status: Cultivated. 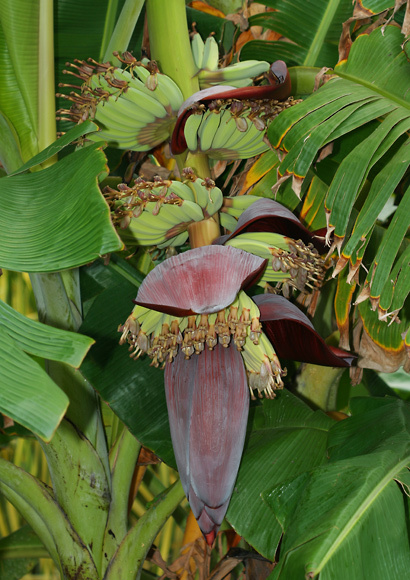 This food plant is native to tropical Asia. Flower Color: White to cream, Yellow, Brownish. The much more conspicuous floral bracts are red to dark purple. Description: The inflorescences emerge from the top of the plant and are very large, drooping, elongating, and have large, red to dark purple bracts that open to reveal double rows of male or female flowers. The female flowers are the first to open on the young inflorescences. The male flowers open later after the fruit is formed. 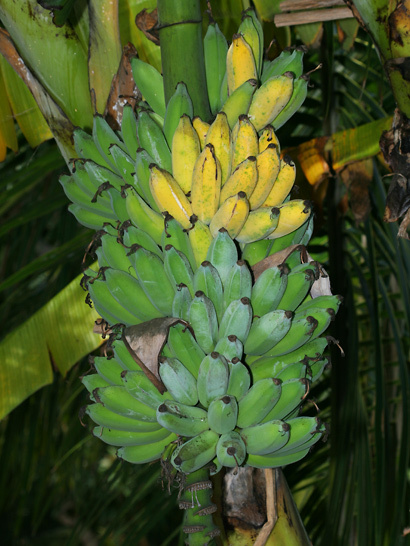 The female flowers are followed by curved, green ripening to yellow bananas with soft, sweet, seedless, white or yellow flesh. The fat, fleshy, trunk-like pseudostems (formed by the leaf sheaths) arise from underground rhizomes. The pseudostems die after flowering. The leaves droop on either side of their stout midrib and are large, green, oblong in shape, and often split by the wind. The plants are suckering and form dense clumps. 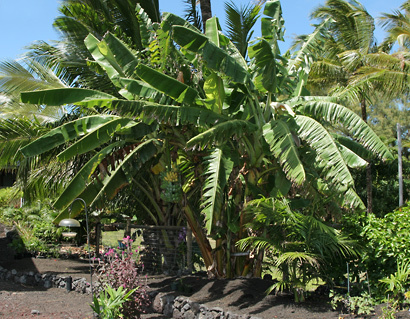 Here in Hawaii, Bananas are a common garden plant in tropical lowland areas. The plants grown here are genetically triploid and therefore sterile (seedless), so the suckers (clone plants that sprout from the parent plant) are instead used to propagate them. The similar French Plantain (Musa × paradisiaca) can be found growing wild here and has starchier fruit that is typically eaten cooked. 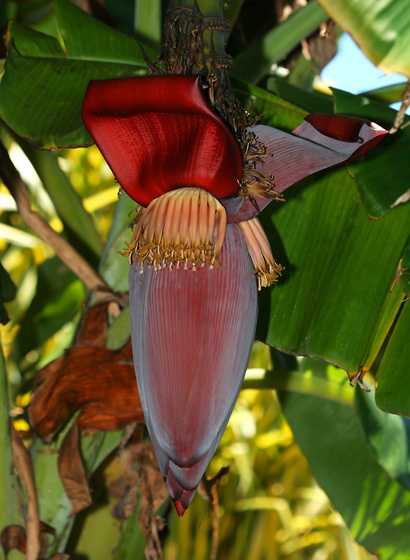 Flowering Banana (Musa ornata) and Hairy Banana (Musa velutina) have upright (non-drooping) inflorescences. Edible – The sweet, soft, seedless flesh of the ripe fruits is edible either raw or cooked. The fruits continue to ripen after picking. This is the familiar sweet desert banana of commerce.